By the time we signed up for a booth once we had launched the organization at SHOT Show, we were number 97 on the waiting list for a booth, so that wasnâ€™t an option. I am pleased to be able to announce that not only do we have a booth at NRA in Louisville, KY, next year, but because of the generous assistance of KA-BAR, we have an excellent location instead of the usual lousy first-timers’ location. KA-BAR added another 10 ft. space to their booth and we will have use of that, mid-show floor and near the popular NRA store. While it does not gain us any seniority for our own booth, right now it is more critical that we be better positioned to recruit new members and this location will help us in this. 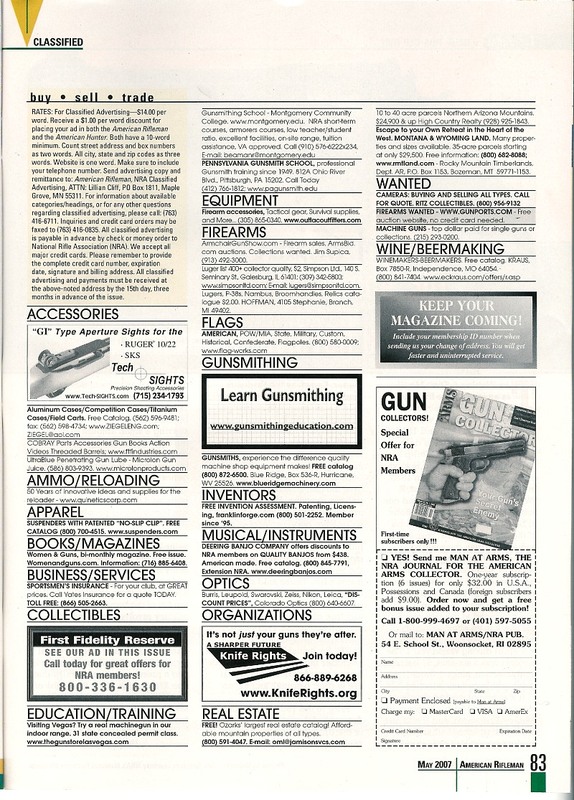 This month also marked the inaugural appearance of our advertisement for Knife Rights in NRA’s American Rifleman magazine. See the May issue, page 83. While it’s small, this type of advertising has proven effective when it is repeated month after month. I also met with a number of people and companies that we hope will result in expanded support for Knife Rights, both in terms of corporate assistance and in media coverage. Iâ€™ll be following up on these in coming months and the results should show themselves a bit later on this year. While I wish things could be accomplished faster, we continue to make progress and sign up members, all positive signs. 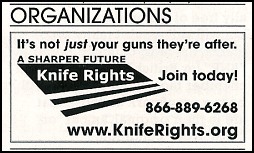 Knife Rights will have a booth at Blade Show in Atlanta (June 8-10) and I hope you will drop by. We need volunteers to staff the booth, so if you can spare a few hours of your Blade Show weekend, please drop me an email at dritter@KnifeRights.org and indicate what times over the three days you would be available. This past week has certainly been a tragic one for many. Our sympathies go out to the family and friends of those who lost their lives to that madman. For the Antiâ€™s, it is like manna from heaven. Tragedies that fuel emotional kneejerk reactions, instead of rational action, are their most effective way to get what they cannot get otherwise. For the pro-firearms folks, they are in for another fight for their lives. Those of us who hold knives dear can take a lesson from this tragedy and the reaction. One has only to look to England where media coverage of crimes using knives have spiked and where the emotional kneejerk reaction has been to introduce even more draconian laws and penalties on top of some of the worlds most restrictive knife laws. All this despite there being little evidence of any actual increase in violent crimes using knives, just a media blitz started by a grieving mother. Even a leading law enforcement official says it wonâ€™t do anything about the problems, but the Antiâ€™s are celebrating. Sooner or later we will have some horrible and tragic event involving knives and the Antiâ€™s will jump on it to fuel their effort to pass ever more restrictive knife laws. It may be a local effort, or at the state or national level. Regardless, as it now stands, thereâ€™s not much anyone could do about it because they are organized and we are not. They have political muscle and we do not. That is the lesson to be learned from this. We are defenseless because we are not organized. The Antis know this and they will try to do the same here as they have done in Britain and elsewhere, take away your right to carry even a simple pocket knife, given half a chance.